Reservists play an important part of the defence system in the UK and the Government and the Ministry of Defence recognise that the support of employers is vital in the success of this. 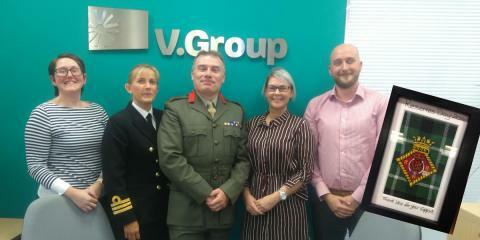 V.Group’s support of reservists was recently recognised in a visit from commanding officers to the Glasgow office where purchasing officer, Robert McLellan, a reservist for the past six years, is based. Robert joined V.Group in 2014 and also serves as a logistician at HMS Dalraida located in Govan, Glasgow. While he has yet to be mobilized for active service, he and his line manager Joanne McCulloch are fully aware that it could be a reality. However even without active service, there is still a great deal of flexibility required and Robert is grateful for the support of not only Joanne but also the wider team. The Royal Navy Reservists offers volunteers with an opportunity to learn new skills, which are transferable to the workplace so employers benefit too. The visit to our Glasgow office was arranged as part of Reserves Day 2016 and was an opportunity for the visiting commanding officers to convey their gratitude for our support of Robert as well as the chance for us to understand more about his role as a reservist. Colonel Jeff Moulton, deputy commander Maritime Reserves, CMRHQ Navy Command HQ Portsmouth and Commander Lesley Stephen, Royal Naval Reserve of HMS Dalraida presented V.Group with a plaque to commemorate the visit.